A big hello to the long-awaited European Spring, and welcome to our April 2014 Newsletter – it is good to have you with us. To start this Newsletter we go to the historically important event of the year, namely the 2014 Hans Christian Andersen Awards. At the IBBY Press Conference on Monday, 24 March in Bologna, Andersen Jury President María Jesús Gil announced that Nahoko Uehashi from Japan was the winner of the 2014 Hans Christian Andersen Author Award, and Roger Mello from Brazil the winner of the 2014 Hans Christian Andersen Illustrator Award. 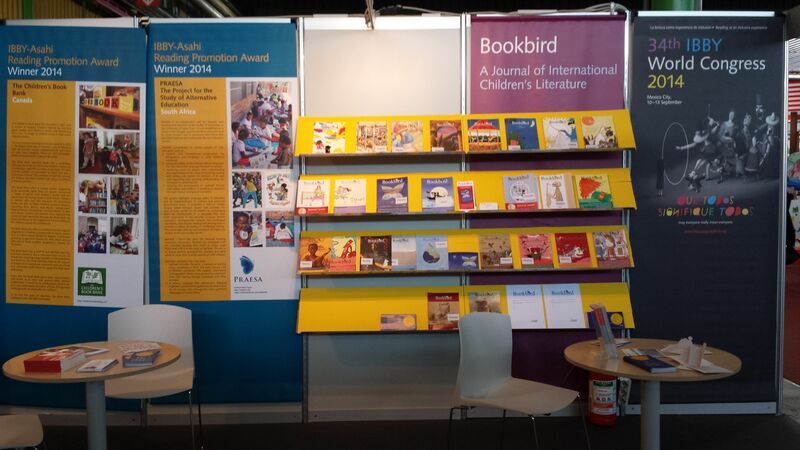 We send our sincere congratulations to the winners and to their nominating IBBY sections of Japan and Brazil. The medals and diplomas will be presented to the winners during the opening ceremony of the IBBY Congress on Wednesday, 10 September in Mexico City at the magnificent José Vasconcelos Library. Uehashi was selected from 28 authors nominated for the Award. The five finalists were Houshang Moradi Kermani (Iran), Ted van Lieshout (Netherlands), Mirjam Pressler (Germany), Renate Welsh (Austria), and Jacqueline Woodson (USA). Mello was selected from 30 illustrators nominated for the Award. The five finalists were Rotraut Susanne Berner (Germany), John Burningham (UK), Eva Lindström (Sweden), François Place (France) and Øyvind Torseter (Norway). For the full list of nominees, go to the IBBY website. Before the opening of the Bologna Children’s Book Fair programme began, two important IBBY meetings took place: the Bookbird Inc. Board meeting on 21 March, and the IBBY Executive Committee meeting on 22 and 23 March. 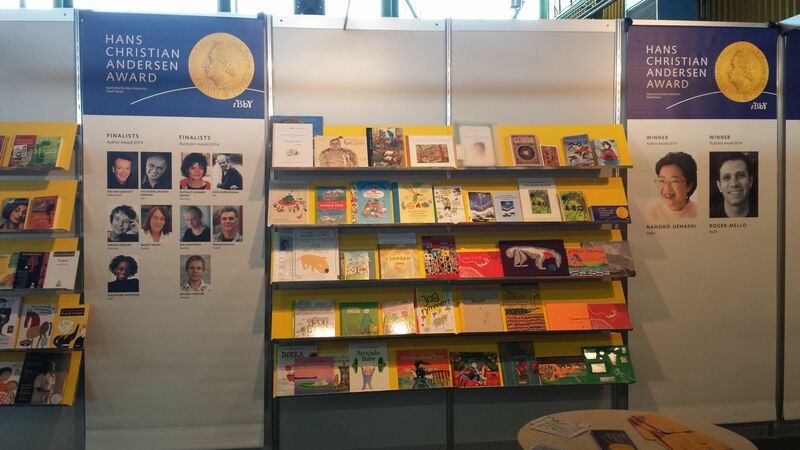 A big thank you to all those who visited the IBBY stand in Bologna in hall 29 last month. Another thank you must go to the representatives of the European IBBY sections who attended the annual regional meeting at the fair on 26 March. There is a brief report about the meeting later in this newsletter. 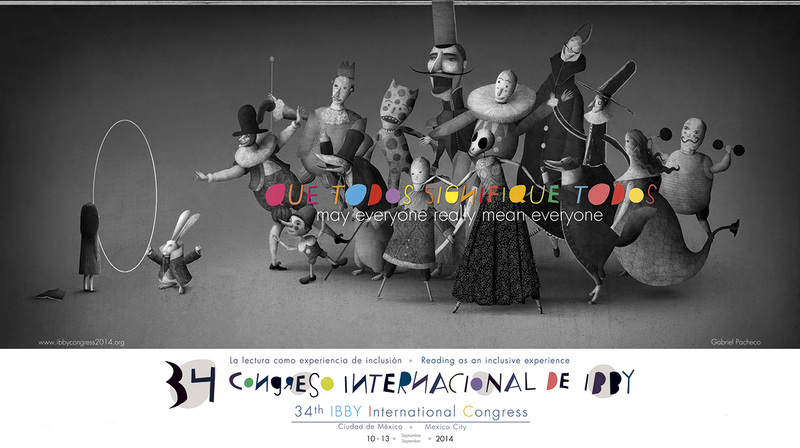 We hope that you are ready for the next big adventure – the 34th IBBY World Congress in Mexico! Information is available on the Congress website and to find out why you should go, read the 5 reasons why you must not miss the 34th IBBY World Congress! Further in this Newsletter find out about the interesting activities and events that are taking place around Europe: Cyprus, France, Estonia, Germany, Russia, the UK, Slovenia and Ukraine. Thank you to all who have contributed with your words and pictures. The ‘3 questions to…’ this time were addressed to Leelo Märjamaa from IBBY Estonia. We would like to thank warmly David Pintor, who has, once again, designed the header of this Newsletter, and Liz Page, who has done all the proof reading! Enjoy the Newsletter and remember to register for the IBBY Congress – Early Bird registration is open until the end of June – don’t delay! See you in Mexico City! Until then, enjoy the summer! Representatives of IBBY Sections from Belgium, Cyprus, Estonia, France, Ireland, Italy, Russia, Slovenia and Turkey took part in the Regional meeting of the European sections on March 26, in Bologna. The agenda of the meeting included the exchange of news from the European sections, the current position of IBBY Europe’s Facebook page and how to develop it further, as well as news about the IBBY Europe website and other business. 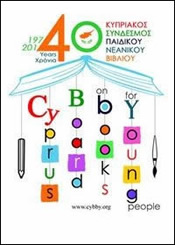 Our colleagues from Cyprus, Costas Katsonis and Frixos Michaelides, talked about the activities and the events devoted to celebrating the 40 years of IBBY Cyprus. Eva Devos from the Flemish Branch of IBBY Belgium told us about the progress of the O Mundo project. The project identifies and buys excellent books from all over the world that can help migrant children feel at home and allow them to share something about themselves and their culture with others, thus opening the eyes of their class-mates to the value of a multicultural society. As you know the IBBY Turkey is preparing for the 2018 IBBY Congress in Istanbul. Gulçin Alpöge and Asli Motchane gave a short presentation of the preparations so far. Deborah Soria from IBBY Italy shared interesting information about the Lampedusa project “Silent Books” and told about the successful IBBY Camps that took place on Lampedusa in June and November 2013. Tjasa Urankar (IBBY Slovenia), Valerie Coghlan and Grainne Clear (IBBY Ireland), Leelo Märjamaa (Estonia), Hasmig Chahinian (IBBY France), Angela Lebedeva (IBBY Russia) gave short reports about their Sections’ activities. During the Regional meeting there was a lot of discussion about the IBBY Europe website where we present selections of books in languages spoken in Europe. The project started a year ago during the 2013 Regional meeting. Some European sections have not yet put in their selections of 10 fiction books in their own language. Please join this important and significant project and add your own selections! The guidelines on how to upload your selections and your access codes were sent to your National Section in January 2014. If you have any questions or problems, please, don't hesitate to contact Hasmig. We hope to be able to show the website at the Mexico Congress 2014! To learn from the best! In this column we address 3 questions to a member of a European Section of IBBY. In this issue, meet Leelo Märjamaa from IBBY Estonia! Do you have a name to suggest for the next issue? Send us a mail! I’m a translator and also a publisher of a small publishing house Draakon & Kuu, which specializes on quality fiction and picture books for children, mainly translations from all around the world. When I choose fiction to be translated, the most important things are a good story and writing that touches me, be it beautiful or funny or both. I remember how emotional it was to translate Kate DiCamillo’s Tiger Rising and Because of Winn-Dixie, and I remember how I was laughing to tears while translating Louis Sachar’s Wayside School series. (If you haven’t read those books, please do!) I love to work with poetry, funny rhymes especially. To translate the verses of Roald Dahl or Julia Donaldson is like eating ice-cream all day long – it is absolutely delicious. Translating good fiction is rewarding on many levels. I’m sure that these books will bring joy to the children who read them and hopefully these children will grow up to be adults who have their hearts in the right place. And this is what motivates me. 2. Among all the activities organized by IBBY Estonia, which one is your favourite? Why? The section of IBBY in Estonian is quite small and for most projects we team up with other organizations, most often with the Estonian Children’s Literature Center. Joy of Books is a nice project that we started together with the Estonian Children’s Literature Center two years ago – the project provides Tallinn Children’s Hospital with new books. Another project – IBBY Library in the Park – has also become a nice tradition. From May to September we have a bookshelf with selected award-winning books, IBBY Honor List titles included, on the terrace of Miia-Milla-Manda Children’s Museum in Kadriorg Park. Children who visit the park or the museum can pick up the books and read them either while swinging in a hammock or lying on the grass. One of the great things about both of these projects is that we bring good literature to kids who don’t necessarily have many books at home and introduce them to something wonderful. 3. 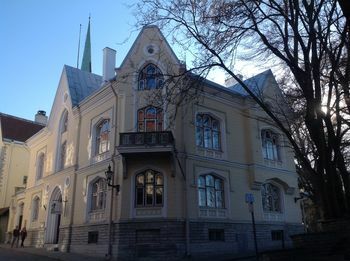 What is your favourite spot in Tallinn, the one you would recommend all our readers to go to? 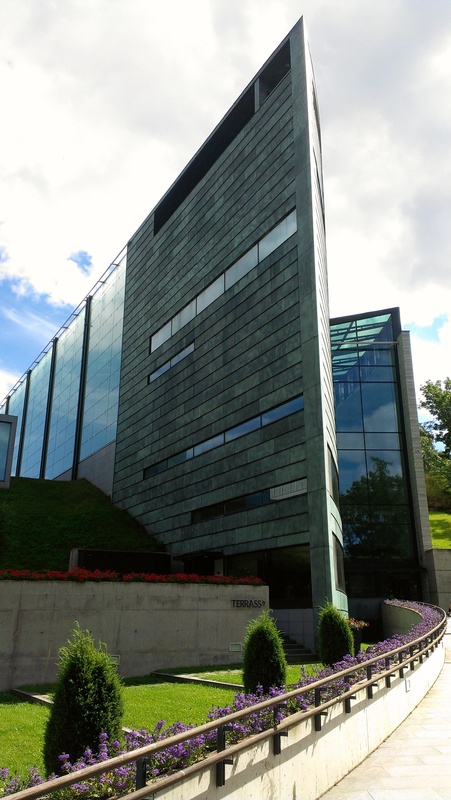 KUMU Art Museum in Tallinn. 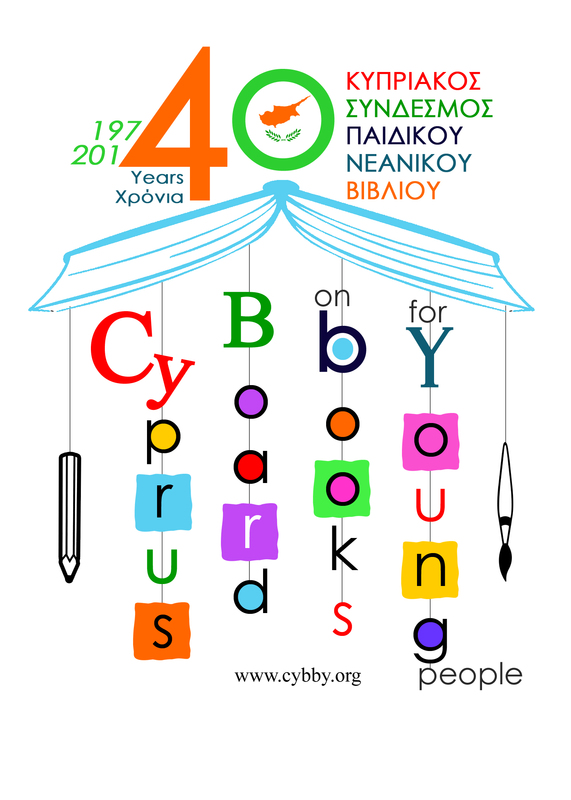 The Cyprus Association on Books for Young People is celebrating its 40 years of existence (1974 – 2014) and is organizing a series of events during 2014.
b) Any literary category for new authors. 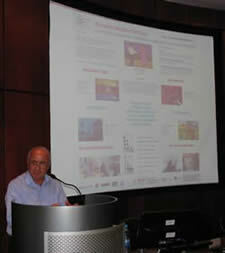 The same day Cybby was presented through the media, referring to the Association’s contribution for the promotion to children’s literature. 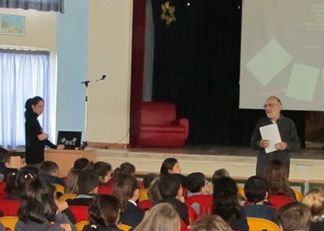 The poster and message of IBBY was distributed to all primary and secondary schools in Cyprus through the Cyprus Ministry of Education and Culture. In September, storytellers will narrate Cyprus folk tales in the main streets of all the major cities of Cyprus. In 2013 and early 2014 Cybby was engaged in a series of events promoting children’s literature. A two-day conference concerning the Eumof programme (European mobility folktales) for MA students of education and school teachers to promote multiculturalism and tradition among European countries: Austria, Cyprus, Greece, Italy, Poland and Portugal in cooperation with the University of Nicosia. Twenty four stories are translated into all languages to help children in Cyprus and elsewhere to read these wonderful stories. Presentation of the National Award winners [Authors (Novel and short stories) and Illustrator] in cooperation with the Cyprus National Library. Between January and February (On January 30th Cyprus celebrates the three hierarchs-saints of education: John Chrysostomos, Vasilios the Great and Gregorios the Nanzianzinian) authors and illustrators visit schools all over Cyprus in an effort to promote children’s books: storytelling, discussions, illustration workshops, book-creation and other activities are made with collaboration with the school teachers. Cybby is planning a series of events until the end of the year for children and adults to bring people closer to children’s literature in a more joyful and pleasant way. Every year, IBBY France organizes a seminar dedicated to the children's literature of the Paris book fair's guest of honour. This year, the guest country was Argentina. The history of children's literature in Argentina is closely linked to the social and political developments in the country and the succession of different regimes, from its independence in 1810 to the establishment of democracy. This very complex political context has incited writers to get highly involved in reading promotion, as reading was considered a space of freedom. The seminar was an opportunity to discover children's literature in Argentina, its evolution, its authors and reading promotors (see the programme). It was held at the French National Library and organized with the help of the Secretariat of Culture in Argentina, in partnership with the Paris Book Fair and the National Book Centre. Cuentacuentos de la Fundación Mempo Giardinelli). IBBY-Asahi Reading Promotion Winners 2012. François Place, the nominee of IBBY France for the 2014 Hans Christian Andersen Award in the illustration catagory, was part of the shortlist! 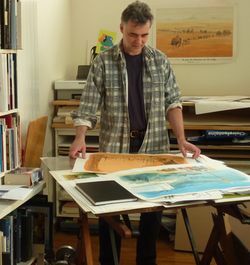 More on his work on his website. In November 2013, the Tower of Babel Honour Diploma was awarded. The Diploma is given by IBBY Estonia to a foreign author for an outstanding children’s book published in a foreign language and translated into Estonian. 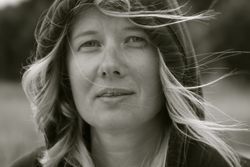 The award went to Norwegian author Maria Parr for her book Vilgukivioru Tonje (Tonje Glimmerdal), translator Riina Hanso and the publishing house Eesti Raamat. 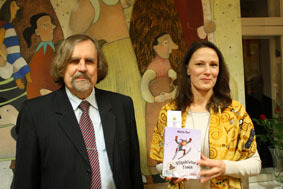 The aim of the award is to encourage the translation of outstanding foreign children’s books into Estonian. 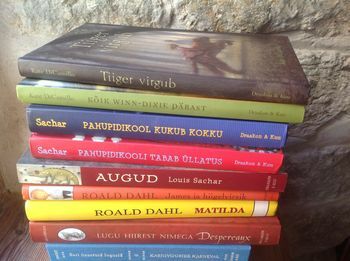 While IBBY Estonia selects the best translated books for children, The Cultural Endowment of Estonia selects the best children’s books by Estonian authors. The Cultural Endowment Annual Award 2013 went to Anti Saar for his novel Kuidas meil asjad käivad, illustrated by Alvar Jaakson (Tänapäev, 2013). Children’s choice award Nukits 2013 went to author Ilmar Tomusk for his series of detective stories, including Kriminaalne koolipapa and Kriminaalsed viineripirukad (Tammerraamat 2012-2013) and to illustrator Heiki Ernits for his illustrations for Janno Põldma’s Lotte ja kuukivi saladus (Eesti Joonisfilm, 2013). 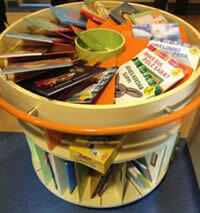 In 2012, IBBY Estonia and the Estonian Children's Literature Center started a the Joy of Books program. 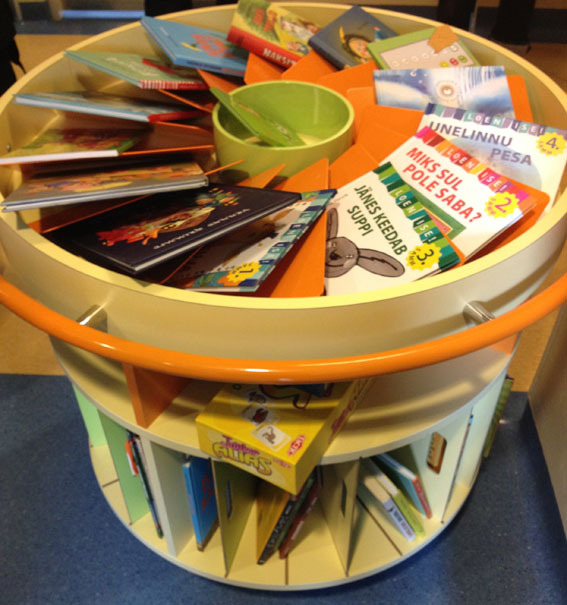 Our aim was to provide Tallinn Children's Hospital with good children's literature. Once a week our volunteers would visit the hospital and read with children. Today, two years later, the program has grown into much bigger project than we had dared to hope. Children Charity Foundation Aitan Lapsi has funded the program and working with several sponsors funded 33 carousels of books for children’s hospitals all over Estonia. The carousels on wheels are specially designed and built to fit the hospital environment. Each of them contains about fifty books and several educational board games. The hospitals team up with the local libraries and the librarians help to take care of the books and organize volunteers to read with children. IBBY Estonia Library in the Park will open again in May, and children will have the opportunity to read good books – IBBY Honor List titles and the books awarded with the Tower of Babel Honour Diploma – while visiting Kadrioru Park in Tallinn during summer months. Happy Spring from IBBY Estonia! On 13 March the nominees for the 2014 German Children’s Literature Award (Deutscher Jugendliteraturpreis) were announced at the Leipzig Book Fair. The award is Germany's only state-sponsored prize for works of fiction. It is administered by the Arbeitskreis für Jugendliteratur/IBBY Germany and has been awarded annually since 1956 by a jury of literature specialists and critics in four categories: picture book, children's book, young adult book and non-fiction. In addition, since 2003 an independent young adult jury gives its own award. Furthermore, a special annual award for lifetime achievement is given alternately to a German author, German illustrator or German translator. The prize winners will be announced on 10 October 2014 at the Frankfurt Book Fair. Austrian writer Sarah Michaela Orlovský and German author Stefanie de Velasco have been awarded the Kranichstein Youth Literature Grants (Kranichsteiner Jugendliteratur-Stipendien) at the Leipzig Book Fair in March 2014. The awards are given annually by the Arbeitskreis für Jugendliteratur/IBBY Germany and the German Literature Fund (Deutscher Literaturfonds). Both authors receive a grant over six months with total benefits of 12.000 Euro. An independent jury chose the winners on the basis of the books in German submitted for the German Children’s Literature Award. 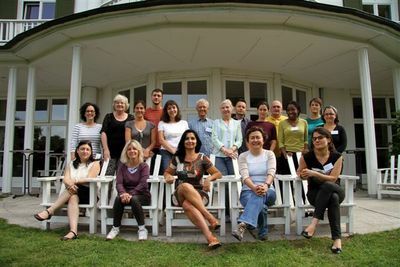 This summer the Arbeitskreis für Jugendliteratur/IBBY Germany with support from the Robert Bosch Stiftung is organizing for the fifth time a one-week, all-expenses-paid workshop (+ travel allowance) focusing on translation of literature for young readers and the role of the translator. The workshop under the title Kein Kinderspiel! or No Child’s Play! will take place from 17 August to 22 August 2014 in Hamburg/Germany. The event will focus exclusively on German Children’s Literature. The workshop language will be German. Professional translators who translate German children’s books into their respective native languages can apply for participation in the workshop. Translators of „small“ languages as well as from Central, Eastern and Southeastern Europe, from North Africa and Turkey will be considered. The deadline for applications is 2 May 2014. 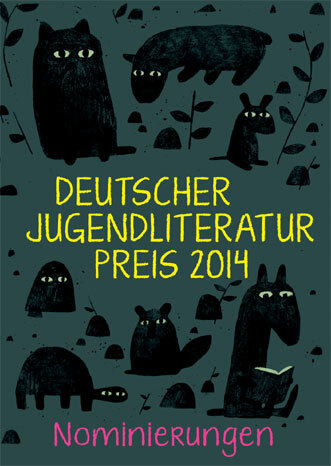 Further details and the application form can be found at www.jugendliteratur.org and www.bosch-stiftung.de. The last days of March and the beginning of April are associated in Russia with children's books, and since 1943 a special event called “The Children's Book Week” takes place during these days. Now another event has become more and more popular – International Children's Book Day. 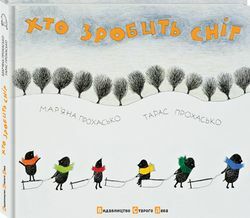 The fact that they take place one after the other gives a unique opportunity to present children literature from all over the world and at the same time to present Russian books for children as part of a global literary event. 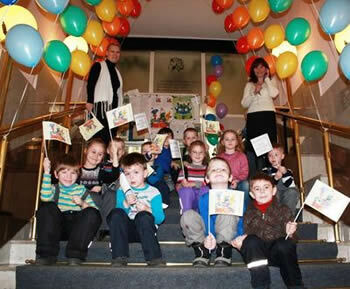 From 2006, the inauguration of both of these events is celebrated together in St Petersburg and region in all the libraries for children's literature. This move creates a special festival that is dedicated to books and reading. With the support of the Cultural Committee of St Petersburg, posters, bookmarks and leaflets with texts by different writers are published. All events taking place are published on a ‘showbill’ – there are more than 100 events including theatre productions, workshops, and meetings with authors and illustrators. This year more than 30 writers and artists met with children during the festival. The International Children's Book Day attracted the attention of the mass media – a press conference was held and afterwards there were many interviews, reports of the events, radio broadcasts and newspaper articles. The festival became the focus for discussing literature for children and the promotion of reading. 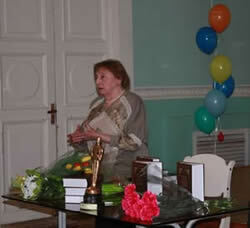 On the opening day the annual meeting of the St Petersburg Branch of Russian IBBY section was held. The most important event during this meeting was the presentation of the anthology Four Centuries of Russian Poetry for Children by Eugenia Putilova, doctor of philology and linguist. This publication is the result of 25 years of intense work of research, collecting and analyzing poetry created for children (1634 – 2000). Among those who took part in the discussion were poets, publicists, researchers in literature, librarians and teachers. 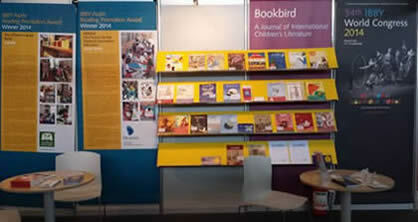 Our new website is up and running at www.ibby.org.uk and much of our news is now there. The site is still in development, particularly our members’ area. 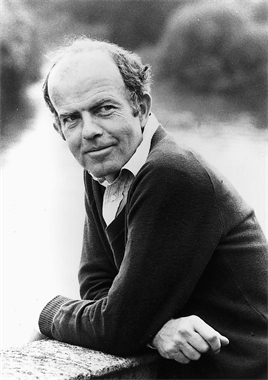 The author Jacqueline Wilson and the illustrator John Burningham were the IBBY UK nominees for the Hans Christian Andersen Awards 2014 and we were delighted to see John Burningham shortlisted for the second time. His first book Borka: the adventures of a goose with no feathers was published 50 years ago and has never been out of print. IBBY UK raised £543 for the IBBY Lebanon project working with Syrian refugee families. 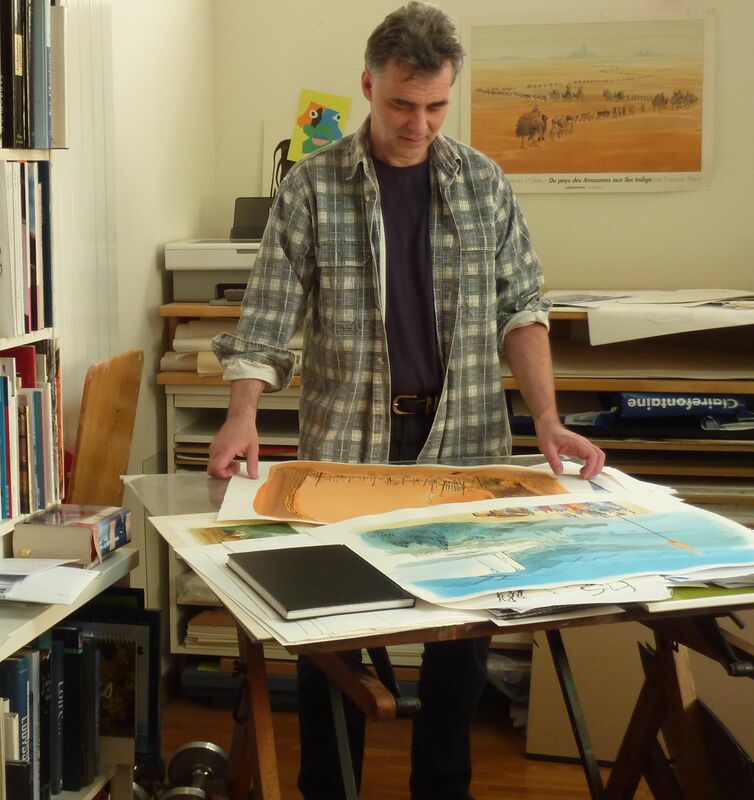 This was mainly through raffles and donations, including the donation of a limited edition print by illustrator Jackie Morris and a complete set of the folio edition of the Susan Cooper fantasy sequence donated by IBBY member Ellen Ainsworth. The theme of last year’s conference was “Feast or Famine: Food and Children's Literature". Speakers included Nicki Humble, Jean Webb, Guo Yue, David Lucas, Fiona Dunbar and Ann Harvey. 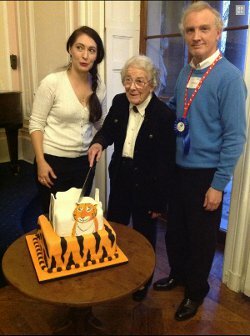 Special guest was author Judith Kerr. 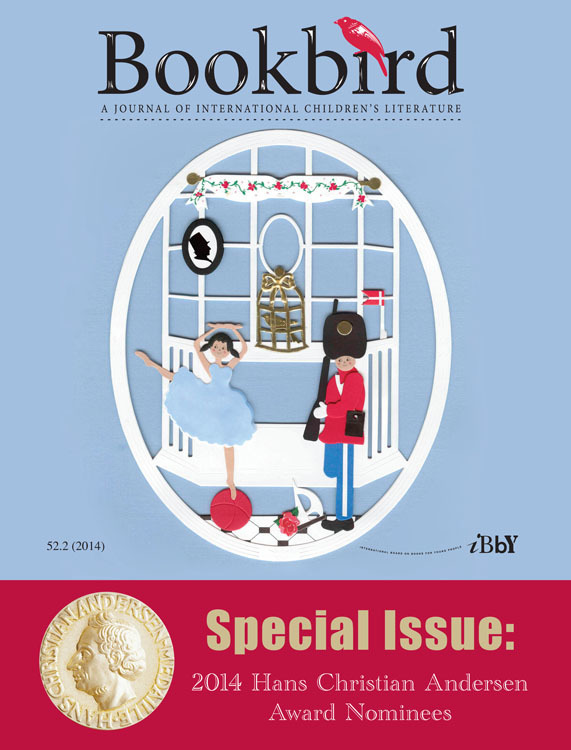 There are photos on the IBBY UK website and short versions of the papers are published in issue 39 of our e-journal IBBYLink (February 2014). For the first time, IBBY UK has been able to offer bursaries for members to attend an IBBY International Congress. Three bursaries were granted to IBBY members Osman Coban, Sophie Hallam and Beth Cox. Pam Dix and Ferelith Hordon from the IBBY UK Committee will also be attending. IBBY UK has nominated Ferelith Hordon for the IBBY Executive Committee. Ferelith is a retired children’s librarian, a former Chair of the U.K. Youth Libraries Group and is the present editor of the online children’s books magazine, Books for Keeps, and the IBBY UK e-journal, IBBYLink. The next issue of our e-journal IBBYLink 40 will focus on non-fiction books under the title Fact Rather Than Fiction and is due out in July. This will be followed in September with IBBYLink 41 and will focus on Books as Bridges looking at books that are enabling e.g. disability, displacement, children surviving difficult situations etc. We are keen to have contributions from outside the UK, so if you are interested in contributing an article in English to Issue 41, please contact our editor, Ferelith Hordon. The theme of this year’s conference will be "Belonging is… An exploration of the right to be included and the barriers that must be overcome" and will be held at Roehampton University, London on Saturday 8th November. Delegates and contributors from outside the UK are welcome. Further details will be available soon; contact Ann Lazim. This year’s Christmas card is being designed by Axel Scheffler, one of the most popular illustrators in the UK and known for his own books as well as his illustrations for Julia Donaldson’s Gruffalo books. Further details will be available soon. Contact John Dunne. 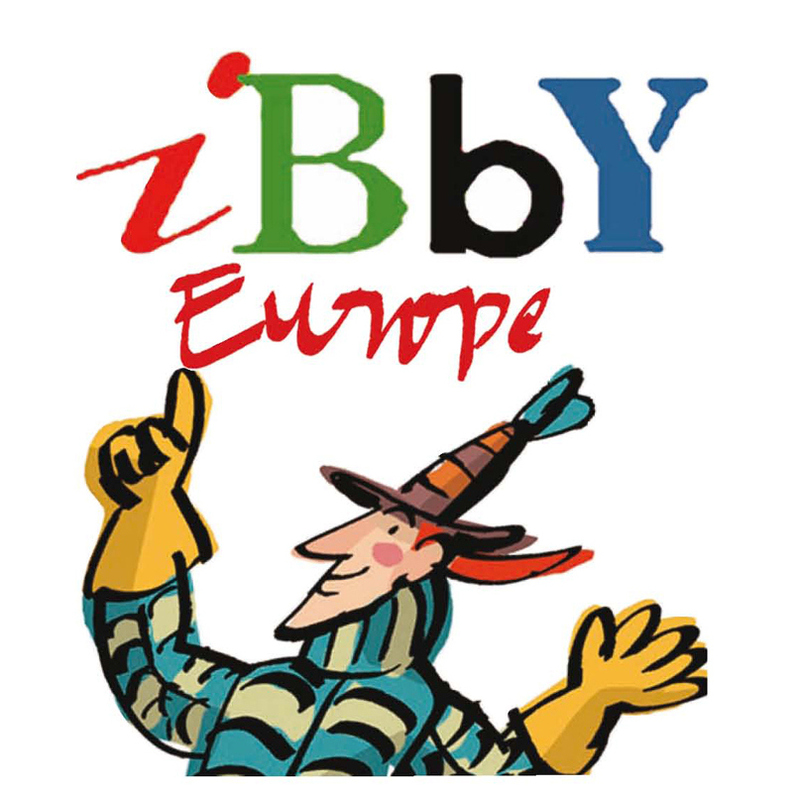 The Slovenian section of IBBY (established in 1992) collaborates with all Slovene factors in the field of children’s literature and reading. A large proportion of its activities are centered around 2nd April - International Children’s Book Day. For ICBD 2014 we founded the reading campaign "The history is hidden in stories / stories are hidden in history". We encourage reading stories related to history, history books, as well as interpretative fairy tales ... in short "stories, in which history is hidden". Primarily to learn about the history of Slovenes, of course, but also the history of other nations. Even the poster for ICBD 2014, created by Niamh Sharkey, says "imagine nations through story." Siobhán Parkinson in her message says: "... the imagination is in my head, of course, and it is made of pictures and words and memories and traces of other stories ..." The campaign started on 19th March - the World Storytelling Day, it includes 2nd April - the International Children’s Book Day and 23rd April – World Book and Copyright Day, it will last till the end of this school year. It joins the celebration of 2,000 years of Emona (a Roman settlement in the place of Ljubljana, the Slovene capital), 100 years of the beginning of the World War I (1914) and 75 years of the beginning of the World War II (1939). 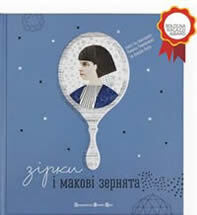 The initiator and organizer of the campaign is the Slovenian section of IBBY and Pionirska -Centre for Youth Literature and Librarianship, co-organizers are Slovene Reading Association, Slovene Reading Badge Society, Slovene Writers' Association - Section for Youth Literature, the journal The Child and a Book at Maribor Public Library. Slovene Reading Association and Pionirska prepared recommended lists of historical stories and other books related to the history. Pionirska prepared also the exhibition and symposium (on 16th April) about history books. Illustrated by Maryna Puzyrenko, E. T. A. Hoffmann’s classic novella The Nutcracker and the Mouse King is included on IBBY’s Honor List and will be presented at the IBBY Congress in Mexico, 10-13 September 2014. The book was published in 2011 by Ranok Publishing House. 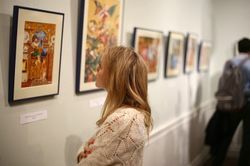 An exhibition of illustrations from the best books of The A-ba-ba-ha-la-ma-ha Publishing House was held at the Ukrainian Institute of America, New York (December – January). 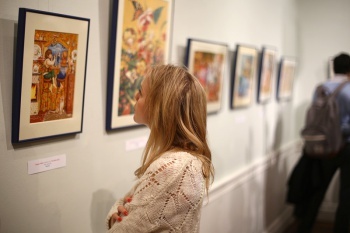 The exhibition displayed the original hand-drawn illustrations of outstanding Ukrainian children’s book illustrators such as Vladyslav Yerko, Kost' Lavro, Sofia Uss, Kateryna Shtank, Victor Garkusha, Zhenia Gapchinska, and many others. You can read more about the exhibition at The A-ba-ba-ha-la-ma-ha Publishing House website. This year, Ukraine celebrates Taras Shevchenko's 200th Birthday. Taras Shevchenko (1814-1861), who was the greatest poet, writer, and artist as well as a political and social activist, has a very special place in the hearts and the minds of Ukrainians. He is often regarded as the founder of modern Ukrainian literature written in the Ukrainian language. His first collection of poems entitled Kobzar (The Bard) (1840) was republished a number of times as a whole collection, and many of these poems were selected and published in Kobzar for Children. In 2013, The Old Lion Publishing House published Kobzar for Children edited by Zirka Menzatjuk and illustrated by Kateryna Myhajloshyna. While the book was widely acclaimed in its first year of publication, in 2014 the book became an essential tool for a number of reading events across Ukraine and within Ukrainian Diasporas in many countries of the world. This year The Old Lion Publishing House organized a number of events for children, among which was the release of an audio CD and videos of Shevchenko’s poems that will be used for a variety of celebrations. 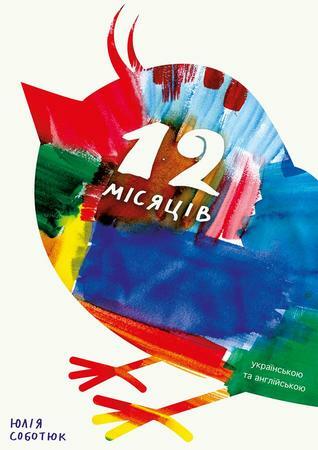 The Osnova Publishing House recently published an e-book, 12 Months, created by Yuliya Sobotyuk. First published as a bilingual (English-Ukrainian) picturebook that narrates how a mother sparrow teaches her young about the seasons, the book attracted the attention of a wide-ranging reading audience. 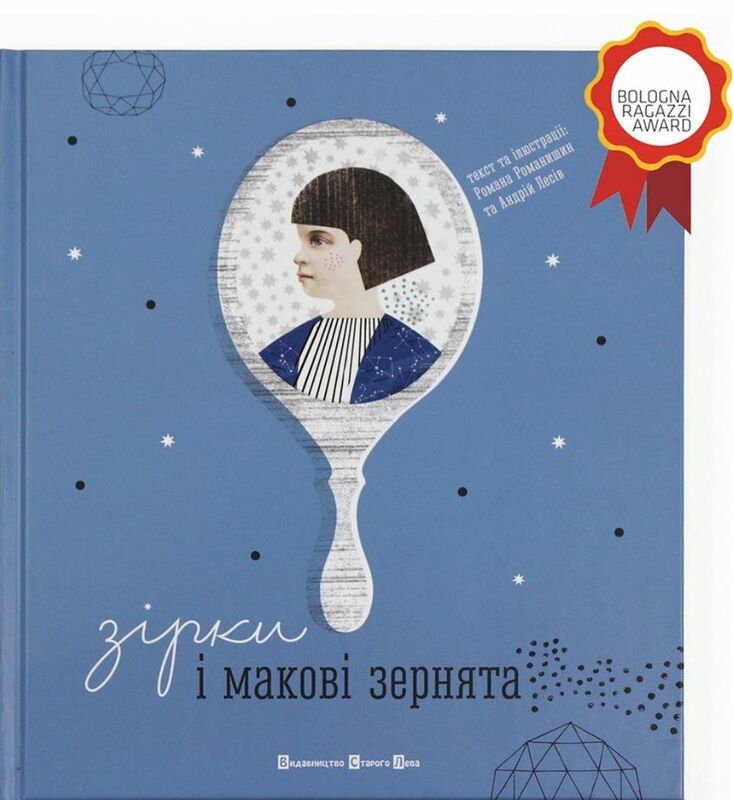 Combining two languages and mixed media illustrations, this book basically initiated a trend of bringing child-like illustrations into focus through Ukrainian art in picturebooks. The e-version of 12 Months is now available in English. The bilingual e-version of 12 Months is coming out soon! 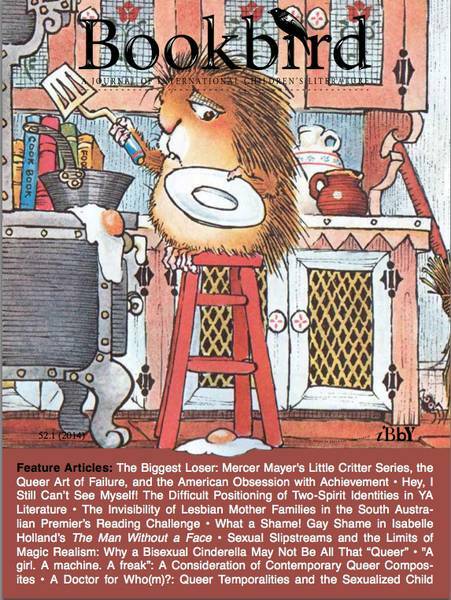 The theme for the first issue for 2014 is LGBTQ or Queerness and Children’s literature. An introduction by Laura M. Robinson, associate Professor and head of the English Department at the Royal Military College of Canada, talked about this theme with the subtitle: Embracing the Negative. A variety of articles explore the theme with reference to queerness in texts written specifically for children and young people. They cover a range of approaches and types, from picture books to television shows. An exploration of the Little Critter series written by Mercer Mayer embraces the negative of the introduction and shows how constant failure can be celebrated as it yields unexpected achievements. Little Critter is featured on the cover of the issue – failing to get a fried egg for his mother onto the plate! Other essays cover topics such as two-spirited identities, lesbian mother-families, bisexual shame, challenging the sexual stereotyping among children, the critical reception of gay-themed novels for young adults, and identifying effective trans novels for young readers. The review section features two books dealing with the main theme. The secondary literature highlighted by the IYB covers four titles with themes as diverse as picture books, immigration, books for early child readers (1700-1840) and war/political conflict. 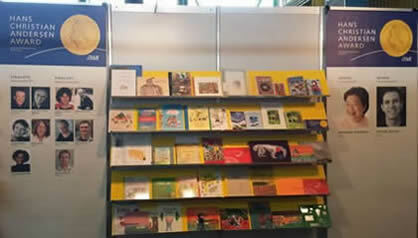 Focus IBBY includes IBBY activities around the world and the ICBD posters and message produced by IBBY Ireland. Bookbird can be read on-line through Project Muse. To subscribe, please fill out this form. More information on: IBBY's website. Theme: Que todos signifique todos, May everyone really mean everyone.